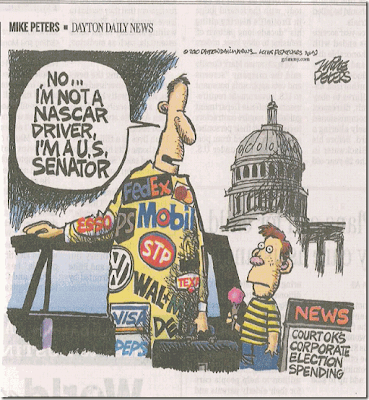 Mish's Global Economic Trend Analysis: "No, I'm Not A Nascar Driver"
"No, I'm Not A Nascar Driver"
The justices overturn a century of U.S. electoral law by a 5-4 vote. Millions of extra dollars are expected to start flowing from big business to Republican candidates. Overturning a century-old restriction, the Supreme Court ruled Thursday that corporations may spend as much as they want to sway voters in federal elections. In a landmark 5-4 decision, the court's conservative bloc said that corporations have the same right to free speech as individuals and, for that reason, the government may not stop corporations from spending to help their favored candidates. The ruling -- which will presumably apply as well to labor unions and other organizations -- is likely to have an impact on this year's congressional elections. Many political analysts and election-law experts predict that millions of extra dollars will flood into this fall's contests, much of it benefiting Republican candidates. While Republicans praised the decision as a victory for wide-open political speech, Democrats slammed it as a win for big money. President Obama called the ruling "a major victory for Big Oil, Wall Street banks, health-insurance companies and other powerful interests that marshal their power every day in Washington to drown out the voices of everyday Americans." He promised to seek "a forceful response to this decision" from Congress. Some Democrats talked about seeking legislation that would require corporations to get approval from their shareholders before spending money on politics. Until Thursday, corporations and unions were barred from spending their own treasury funds on broadcast ads, campaign workers or billboards that urge the election or defeat of a federal candidate. This restriction dates back to 1907, when President Theodore Roosevelt persuaded Congress to forbid corporations, railroads and national banks from putting money into federal races. After World War II, Congress extended this ban to labor unions. More recently, the McCain-Feingold Act in 2002 added an extra limit on corporate and union-funded broadcast ads in the month before an election. Such ads were prohibited if they simply mentioned a candidate running for office. Thursday's decision swept away all these restrictions. "The government may not suppress political speech on the basis of the speaker's corporate identity," said Justice Anthony M. Kennedy, who wrote the majority opinion. While the case of Citizens United vs. Federal Election Commission dealt only with corporations, the ruling will probably free unions as well. If corporations are persons and there is no limit on how much these persons can spend to buy politicians to write laws favoring corporate persons, if a corporate person buys another corporate person, is that slavery? From the perspective of logical progression, where does this end? The logical thing to do would be to cut out the middle man, and simply vote for corporate lobbyists directly. They write almost all the legislation anyway.